Arnott and Vederoff Ancestors - Headstone of Thomas and Jane Elam Bailey, Fairmont Cemetery, Denver, Denver County, Colorado. G. A. R. on stone. 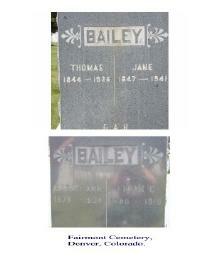 Headstone of Thomas and Jane Elam Bailey, Fairmont Cemetery, Denver, Denver County, Colorado. G. A. R. on stone.